SOMERSET, NJ, October 13, 2015 – Sunbird Software, a global innovator in software solutions that simplify how data centers are managed, announced today general availability of Sunbird DCIM 5.0 (data center infrastructure management) software. Sunbird DCIM 5.0 makes it easier to capture and visualize data center infrastructure information, automate administrative processes, and get answers quickly to capacity and health questions. New in Sunbird’s dcTrack® 5.0 for DCIM Operations is an enterprise-wide, user-configurable dashboard with a modern drag-and-drop tile-based user interface, Live Charts for predictive analysis, and an improved mobile app for at-the-rack audits using smart mobile devices and tablets. Enhancements in Sunbird’s PowerIQ® 5.0 for DCIM Monitoring support new faster health polling, offer dynamic plug-ins for additional MIB configurations, and provide updates to rack thresholds and Smart Pages for viewing of circuit load data. Sunbird’s new Enterprise Dashboard provides dynamic views of an entire enterprise on a single pane of glass – with each data center represented by a color-changing tile based on live data. 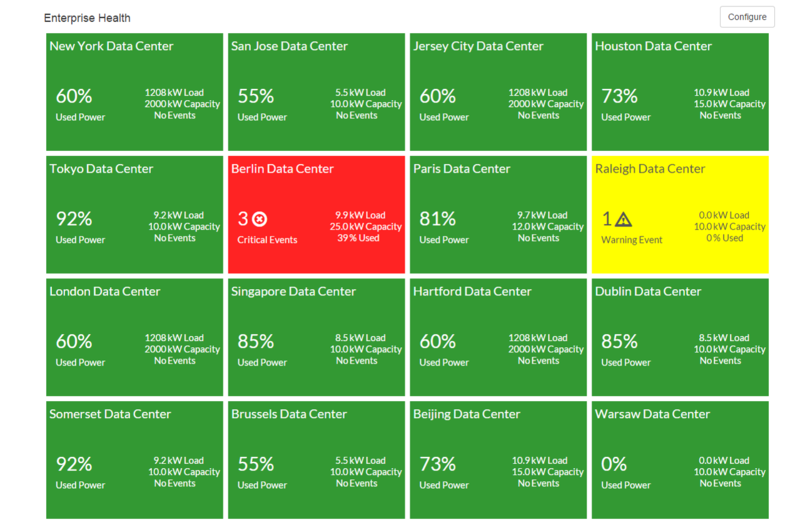 Data capacity and health status are shown with easy-to-understand red, yellow and green indicators. Accessible from any web browser, the dashboard enables users at all levels of an organization to navigate virtually among cabinets, floors, and multiple data centers. A CIO/CEO -- who may be concerned about strategic growth and increasing demand for IT services -- can see at a glance a high-level view of available resources (power, equipment, rack space, ports, cooling) for each data center. Users can perform “what-if” analysis on the impact to resources if servers are added or other changes made to a data center. An operations manager could drill further down to determine which cabinets would be the ideal location to host new servers based on power, cooling and space availability. The manager could also use the dashboard to monitor for potential issues to help meet service level agreements. If there is a problem, the user can quickly see the cascading effect of the problem on all resources. By clicking on a tile, additional detailed information on resources is provided; users can navigate through various logical layers -- down to a health floor map, to a cabinet, then to a server or other asset with details on ports, power connections, energy usage and other valuable information. Enterprise Dashboard views are user configurable with drag-and-drop ease, and can scale to monitor hundreds of sites. A new user interface to DCIM’s Paperless Audit Mobile App makes it easier to conduct audits using iOS and Android mobile phones and tablets. Coupled with a Bluetooth handheld scanner, the audit app’s new bar code search and input capabilities make it easier to track equipment and to make updates on the go. From the data center floor, the app also can be used to initiate requests to install, move, and decommission a device. It can be used to view and complete work orders, as well as verify that an installation was done according to plan. New Live Charts were added to make it easier to identify stranded power capacity in data centers, helping to avoid the expense of deploying new cabinets. Side-by-side views of redundant cabinet PDUs provide valuable information on potential power supply failures. Additional views allow for trend analysis of circuit breaker limits and real-time loads to predict potential failures. Health Map provides a bird’s-eye view of entire white space and visual alerts of abnormal operation conditions that might lead to data center downtime. An inspector with Real-time Readings and alarm details enables drill down capabilities to investigate the root cause and possible remediation. New Specialized Polling Engine optimized for early health alerts. The new alert engine augments the existing data polling engine that is focused on highly accurate data collection at a one-second frequency. Enhanced Import and Export makes it easier to add large amounts of data and quickly and resolves data quality issues with automatic validation. “As the pressure for ‘faster, better, cheaper’ services continues in the delivery of IT services, efficient management of data center resources will be a competitive differentiator. Data center managers are turning to DCIM to keep pace and to gain the most from their existing physical data center resources and to reduce costs. Sunbird Software is changing the way data centers are being managed. Since 2008 Sunbird has been a leading global provider of DCIM software. With a focus on real user scenarios for real customer problems, we help data center operators manage tasks and processes faster and more efficient than ever before, while saving costs and improving availability. We strive to eliminate the complexity they have been forced to accept from point tools and homegrown applications, removing the dependency on emails and spreadsheets to transform the delivery of data center services. Sunbird delivers on this commitment with unexpected simplicity through products that are easy to find, buy, deploy, use, and maintain. Our solutions are rooted in our deep connections with our customers who share best practices and participate in our user groups and product development process. Learn more today at http://www.sunbirdDCIM.com.